Listen to "Humble Pi: A Comedy of Maths Errors" on your iOS and Android device. 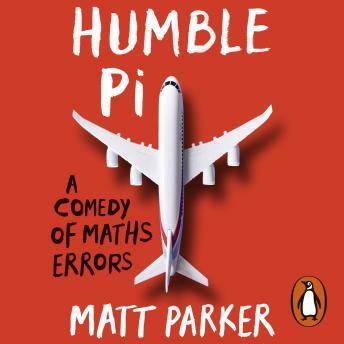 Penguin presents the audiobook edition of Humble Pi written and read by Matt Parker. What makes a bridge wobble when it's not meant to? Billions of dollars mysteriously vanish into thin air? A building rock when its resonant frequency matches a gym class leaping to Snap's 1990 hit I've Got The Power? The answer is maths. Or, to be precise, what happens when maths goes wrong in the real world. As Matt Parker shows us, our modern lives are built on maths: computer programmes, finance, engineering. And most of the time this maths works quietly behind the scenes, until ... it doesn't. Exploring and explaining a litany of glitches, near-misses and mishaps involving the internet, big data, elections, street signs, lotteries, the Roman empire and a hapless Olympic shooting team, Matt Parker shows us the bizarre ways maths trips us up, and what this reveals about its essential place in our world. Mathematics doesn't have good 'people skills', but we would all be better off, he argues, if we saw it as a practical ally. This book shows how, by making maths our friend, we can learn from its pitfalls. It also contains puzzles, challenges, geometric socks, jokes about binary code and three deliberate mistakes. Getting it wrong has never been more fun.